The Calgary Fire Department, Calgary Police Service and Calgary Community Standards are advising Calgarians against boating and all other watercraft activities on the Bow River. Members of Calgary Fire and Calgary Police marine units will be monitoring the river while the advisory is in place. However, The City advises everyone to stay off the Bow River until conditions improve. “For the safety of river users and emergency responders, we are asking everyone to wait until flows return to normal,” Henke says. It is also important for people near the river to be aware of high flow levels. “Calgarians are urged to exercise caution around river banks as the fast-moving water can cause erosion and river banks can collapse,” Henke adds. As always, Calgarians are reminded to use caution and be prepared for anything on the water. All watercraft users should wear life-jackets to avoid a mandatory court appearance and fines. 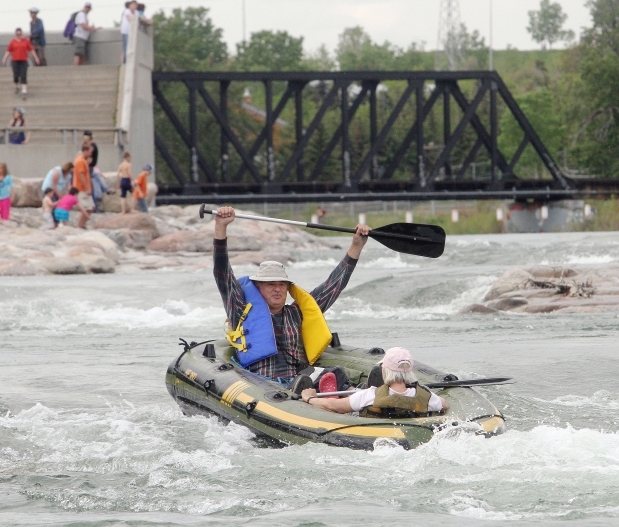 In addition to wearing life jackets, river users should avoid consuming alcohol and other intoxicants on Calgary’s waterways. Next Policeman’s Flats – Flooded! !